Lord Vishnu in his incarnation as Lord Narasimha, came onto this earth to destroy the evil demon Hiranyakasipu and protect his son Prahalad who was a great devotee of Lord Vishnu. The Lord has declared in the Bhagavad Gita that he would always reincarnate on earth for the protection of the good and the virtuous and the destruction of evil in the various Yugas or earthly cycles. 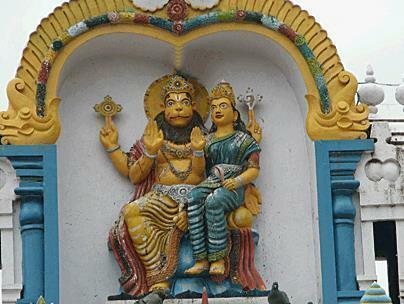 A number of temples in India are dedicated to Lord Narasimha. One of the most ancient temples of Narasimha Swamy is the Yadagirigutta temple in Nalgonda district of Telangana named after the Saint Yadarishi, Giri meaning mountain and Gutta meaning hillock. It is one of the rare temples in India as it is a cave temple situated at a height of 300 ft on the Yadagiri hill, and the sanctum is a natural cavern on the hill. Since it is only 60 km from the city of Hyderabad, devotees flock to the temple especially on Sundays and other public holidays. There is mention of this temple in the Skanda Purana, one of the eighteen well known Puranas. It is said that in the Treta Yuga there lived a sage named Yadarishi. His parents were the great sage Rishyasringa and Santa Devi. Yadarishi began performing rigorous penances inside a cave on the hill between Bhongir (Bhuvanagiri) and Raigiri (in Nalgonda). This sacred spot is at a distance of 5km from the present temple at the foot of the Yadagiri hillock and the sage was said to have been guided by Shri Anjaneya at the behest of Lord Vishnu. Pleased with his steadfastness and deep devotion, Lord Narasimha the incarnation of Lord Vishnu granted him darshan in five different forms Sri Jwalanarasimha, Sri Yogananda, Sri Gandhabherunda, Sri Ugra and Sri Lakshminarasimha. They later manifested themselves into exquisite and fine sculptures that were later worshipped as Pancha Narasimha Kshetram. 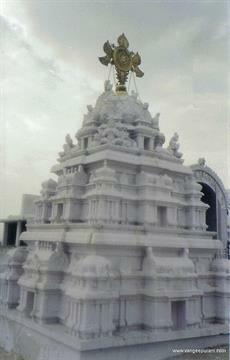 All these five forms are presently worshipped in the temple. 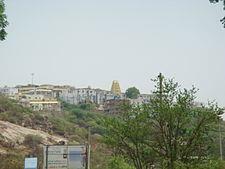 After Sage Yadagiri had attained moksha (Liberation), a number of tribals began worship at this temple but they were not very learned and hence performed worship in an improper way. The Lord Lakshminarasimha then moved into the hills and inspite of extensive search, the tribals could not locate the idol of the Lord. Many years later the Lord appeared in the dream of a devout tribal woman and directed her to a large cave where she found the five majestic Avatars. The Puja and Aradhana in the temple are performed according to Pancharatra Agamam which constitutes the most important texts of the Shri Vaishnava Sampradaya of Ramanuja. According to legends, pleased by Yadarishi’s penances the Lord first appeared as Jwala Narasimha (as a flame) but Yadarishi was unable to face the intensity of this form. The Lord then appeared in a peaceful form in a yogic Padmasana posture with open palms on knees (Yogananda). Yadarishi then prayed to the Lord to grant him darshan with his consort, so the Lord appeared with Goddess Lakshmi on his lap (Lakshmi Narasimha). One has to go through an entrance that narrows down into a dark cave to see these three forms. The cave is formed under a huge rock which slopes to just around five ft in the middle of the passage hence one has to lower one’s head. Symbolically, it indicates the humbling of oneself to approach the Lord. The Jwala Narasimha consists of two rocks fastened to each other forming a vertical cup about one foot between them. The image in the shape of a serpent head and ending like its tail can be seen on the other side of the rock. It is said that a serpent still moves about the image. On the opposite rock is the manifestation of Yogananda and Lakshmi Narasimha. The wide entrance of the cave reveals the fierce mouth of the Lord forming the fiery form (Sri Ugra). Sculpted in the rock underneath the Anjaneya or Kshetrapalaka (ruler of the hill) is the Garuda or eagle form (Sri Gandhabherunda) which is known only by the presence of an eternal lamp that burns within the crevice underneath Shri Anjaneya Sannidhi. All these forms are Self manifested or Swayambhu. Since these forms are sometimes difficult to see inside the cavern that serves as His Sannidhi, the large Silver Murthis of Goddess Lakshmi and Lord Narasimha standing together is the form that is adored and worshipped by all the pilgrims visiting the temple. The region of Yadagirigutta is believed to have been worshipped by Rishis. Narasimha here is known as ‘Vaidya Narasimha’ as He is said to cure chronic ailments and those who have fallen under the influence of witchcraft, black magic and the harmful effects of planets. The Lord by appearing in the dreams of the ailing devotees has administered medicines, performed operations, granted Mantropadeshams and blessed them with good health. People with mental and emotional problems are also said to have been cured at this temple. Devotees perform a 40 day Mandala Deeksha Pradakshina (circumambulation) to pray for a cure for their ailments. 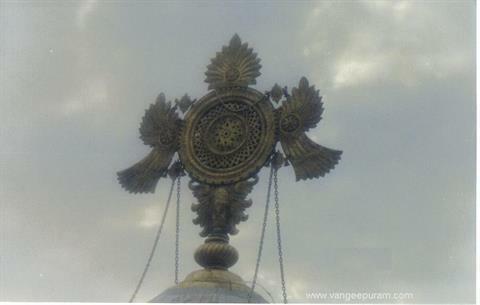 There is a golden Sudarshana Chakra (discus) of Lord Vishnu about three ft by three ft glowing bright atop the Shikhar (pinnacle) of the sanctum sanctorum (Garbha Griha) of this cave temple. This can be seen from a distance of 6 km, and it is said that in earlier times, the Chakra moved in the direction from which the devotees came like a compass guiding the devotees towards the Lord. There is a Hanuman temple on the right side after entering the Simhadwara of the temple. Exactly beneath the image of Hanuman there is a horizontal narrow cavern where the Lord manifested as Gandhabherunda. To the left, there is a big hall for the devotees to sit. The front pillar of the temple is a constructed sculpture whereas towards the rear pillars is a natural cave cut into a hill where the actual shrine of the Lord or Garbha Gudi is situated. On the left of the passage is a Peeta where special Pujas are performed. At the end of the cave are the other manifestations of the Lord. 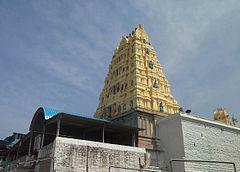 The superstructure of the temple is based on the huge rock which forms the cave. 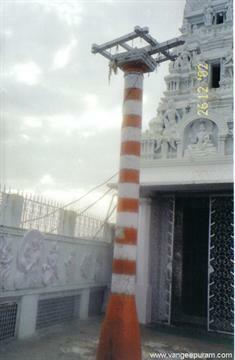 To the left of the front pillar, there is a temple known as Andalamma temple dedicated to the Goddess. For the facilitation of devotees, three large sheds of blue colour Perspex sheets have been created. Through the Gopuram, the main entrance too has a corridor of Perspex sheet. There are fine carvings on the exterior of the Gopuram. 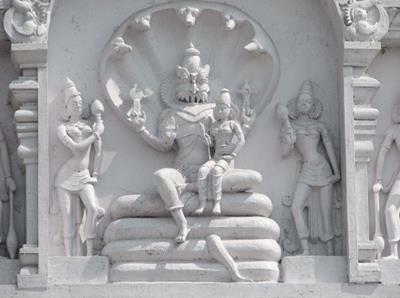 A wide gate has been constructed before the temple complex covering a four lane road, which is made of white marble. Every year Brahmotsavams are performed during the month of Phalgun (Feb- March) for 11 days. During this time, cultural programmes like discourses, Harikathas, Vocal and Dance Recitals, Dramas are performed by well-known artistes. Narasimha Jayanti is celebrated grandly in the month of Vaisakha (April – May). The temple is opened from 4.30 in the morning to 9 in the night every day. Free Prasadas are distributed to the pilgrims daily and counters for buying various Prasadas are also available throughout the day. Various schemes for devotees to donate funds are also available and these funds are used for the maintenance and upkeep of the temple and other facilities for the pilgrims. The Goshala maintains livestock and the milk derived is used for temple activities. Annadanam or free food is distributed to a number of pilgrims. The land sites belonging to the Devasthanam have been used for cultivation of food grains, flower and Tulsi gardens and fruit trees which are used for the temple purposes. The temple also maintains a Sanskrit Vidya Peetha institution and a Prachara Shakha Counter (Publication Centre) where devotional books, calendars, gold dollars and laminated photos associated with the temple and the deity are available. Air- The international airport at Hyderabad is the nearest airport at a distance of 81 km. Rail- The Raigiri railway station is the nearest railway station for passenger trains at 3 km from where autos and cars can be taken to the temple. The nearest railway stations for Express trains are Bhongir at 14 km and Aler at 15 km. Road-Private buses ply from Hyderabad, and there is a good road network to other towns and cities. 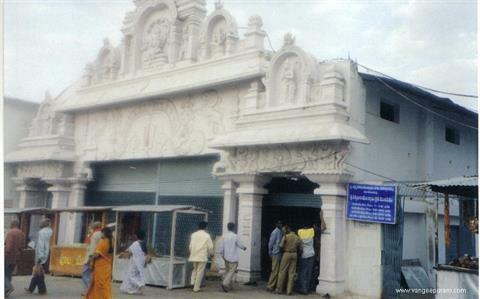 The Temple Devasthanam has dormitories, cottages and choultries which provide accommodation to the devotees on the hilltop including A/c rooms for dignitaries and important guests. At the bottom of the hill also, the Temple Devasthanam has rooms and halls to provide accommodation to the pilgrims. Bore wells have been dug to provide water and water tanks have been constructed enabling the maintenance of gardens. Security measures are adequate with personal and home guards employed to safeguard temple properties and pilgrims. Closed Circuit television sets also ensure round the clock surveillance and protection of the pilgrims. The uniqueness of the temple and its ancient past gives the place a sublime and sacred atmosphere. As the Lord is considered to cure diseases people come from far and near seeking Divine grace. The spiritual vibrations and devotion of the pilgrims enable them to offer prayers and transcend the lower passions while attaining the lofty ideals of self-realisation and bliss.